Today, more than half the world’s population lives in urban areas, and more than two-thirds will do so by 2050. The rapid urbanization that we experience around us places stress on the existing infrastructure and services. Meeting the needs of the growing global urban population will require a radical rethinking in the way we approach urbanization, one that is rooted in sustainable development. The cities of tomorrow will need to be inclusive, environmentally friendly, climate resilient, resource-efficient, technology-driven and should be a place for its citizens to thrive, and live better and healthier lives. Innovation and significant transformation in the way we build and manage urban spaces is pivotal to developing sustainable urban cities. 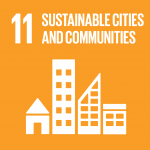 Access to safe and affordable housing, upgrading slum settlements, investment in public transport, creating green public spaces, improving the management of waste, using emerging information & communication technologies (ICT) for better governance and planning, taking a participatory and inclusive approach to urban planning and management, are some of the many ways to make cities sustainable. Conceptual energy design of new low energy building in foreign countries. Design of sustainable masterplans for city development areas in foreign countries including concept for energy supply, water supply, waste management and local traffic in the areas and including design criteria for buildings to be constructed in the new city areas. Conceptual energy design in connection with retrofitting of existing buildings. The client can use the conceptual energy design as basis for tenders among local designers and local contractors to build low energy or carbon-neutral buildings. The client can use the design of sustainable masterplans as basis for selling building plots in the new city development areas. The client can use the energy and sustainable design as a marketing feature to increase the sale and increase the price for new buildings and for building plots. The sustainable design can market the client with a green image.